Well in true gfe-gluten-free easily form, my sweet Shirley has out done herself with the most stunning holiday event yet. Home for the Holidays- Gluten-Free Style (and very Allergy Friendly as well) has kicked off with an enormous bang. Twenty four bloggers are sharing recipes that represent what the home and holidays are all about for them. And there are over 100 prizes you can enter to win – this list is insane. And then a GRAND PRIZE and two runner ups that will knock your socks off! – Grand prize: A top-of-the-line VITAMIX blender! – 3rd Prize : A Giveaway Package from Caveman Cookies worth $89. Each Entry/Comment you leave here will also count towards the Grand Prize, and 2nd, and 3rd Prizes as well! So make sure to maximize your chances! Of course you know I am going to say how steeped in tradition the holidays are for us. And after all, our family has a long list of must-do’s for the season that we stick to like glue. But this last year has brought some unexpected events and experiences that have left me understanding that simple moments are what really make this season bright. Like the pride the boys get when they “help” Dad build the fire…and the sound of their belly laughs that are simply full of pure joy just because Santa will soon be burning his britches and squeezing his jolly belly through our chimney. And like sitting around the breakfast table together in our pajamas during the cold December weekends and enjoying special breakfast treats that are not normally made during the other times of the year. Yes. Those are the kind of traditions that are making the season for me. 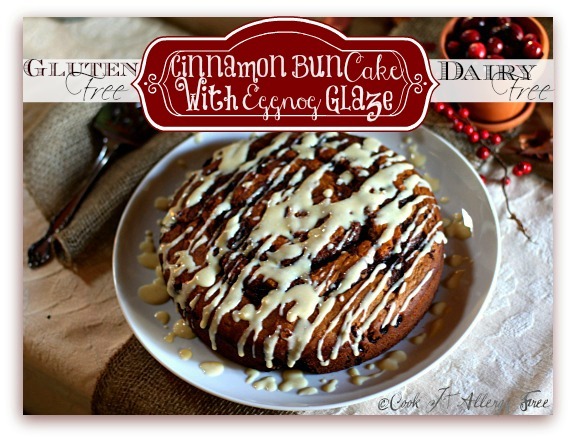 And this Gluten-Free, Dairy-Free Cinnamon Bun Cake with an Eggnog Glaze plays a big role on these special holiday mornings for us. It actually looks like and tastes similar to a giant cinnamon bun, but it is yeast-free, gluten-free, dairy-free, corn-free, and easily egg-free. Oh. And it is waaaay easier (and much faster) to make than real Cinnamon buns. I place a layer of cinnamon bun filling (and a layer of raisins) on the bottom of my pan, then pour half of the batter in. Then, using a ziplock bag with a corner snipped off, pipe a swirl of the filling and add another layer of raisins. Then I place the remaining batter on top of this and pipe the remaining filling in that same spiral pattern. Because we love the filling so much, I have been known to double the filling recipe below for an extra dose of decadence. The result when it is done baking? Does it not look like a giant cinnamon bun? 1. Preheat Oven to 350 degrees. Grease a 9 inch round cake pan on the bottom and sides. Then cut a piece of parchment paper to fit just in the bottom of pan, without letting it go up the sides. 3. In bowl of electric stand mixer, beat Earth Balance Butter (or Butter) and Sugar for 3 – 5 minutes until light and fluffy. Then add eggs (or Egg Replacer), one at a time, continue mixing. Add Yogurt and vanilla and mix again until incorporated. 5. Mix together filling ingredients (Note: if you like a lot of filling, double the filling ingredients). Spoon 3 – 4 Tbsp of filling into bottom of pan and spread evenly with back of spoon. Sprinkle half of the raisins over the filling. Pour remaining filling into a ziplock bag and snip small corner off one side of bottom. 6. Pour half of batter over bottom raisin/filling layer. Then, pipe filling from bag in a circular spiral, starting in center of pan and working outwards. Sprinkle remaining raisins over filling. Then pour remaining batter over raisins. And, again pipe all remaining filling in circular spiral pattern. Use a toothpick to follow the spiral to incorporate it slightly into the batter. 7. Bake for 40 minutes, or until toothpick comes out clean. 8. During the final few minutes of baking, whisk together all of the icing ingredients. Once cake is out of oven, let cool for 5 minutes then cover pan with dish and flip onto plate. Then cover cake with another plate and flip onto that one so cake is right side up. While it is still warm, drizzle the icing evenly over the top of cake. Enjoy! Just remember that each entry brings you one step closer to winning that Vita-Mix! 1. Please leave a comment telling me what makes this season bright for you. 2. Share this giveaway on facebook and come back to tell me that you did. 3. Share this giveaway on twitter and come back to tell me that you did. Note that you will have 48 hours to leave a comment here before it will be closed to entries on December 8th at 10am CST. All of the comments you leave on this post and any other posts by the other bloggers participating will be entered into the Grand Prize Giveaways. The grand prize winners will be announced on Christmas. And do not forget to go back and see the Gluten-Free Red Chile Enchiladas from Gluten Free For Good yesterday and then head on over to Lexie’s Kitchen tomorrow, for what I am sure will be an amazing treat. Yum, yum, yum! Printing the recipe right now! Thank you! I will so be making this cake soon!!! I love cinnamon everything – this is an amazing recipe! What makes this season bright for me is the Name of Jesus: Immanuel means ‘God with us’…the birth of Jesus brought God to earth, to walk among us, so that we absolutely know without a doubt He is aware of us and can comfort us and rejoice with us and give us strength to fight temptation among other things because He has been there…and He not only this but Christmas leads to Easter which validates He was God in the flesh and all He said was True because He died and was raised making it possible for us to be reconciled to God. THIS makes this season more than Bright for me :D! Oh Kim…I don’t know what to say. It’s all beautiful! The cake, and the boys in their jammies reading to each other. Sounds like your family is living a Wonderful Life. Enjoy! I love looking at all of the fun decorations this time of year, and of course decorating my own home. Your recipe looks delicious. My family used to make cinnamon rolls for Christmas breakfast, but I haven’t had any since going gluten free 2 years ago. Now I’m also corn free, so had about given up hope. Now I have a recipe to try! Thank You! I love sharing meals with people over the holidays. I’ll be baking this for my family next Christmas morning! Wow. This looks amazing. Truly. So amazing that I didn’t read the giveaway instructions. So, what makes the season merry and bring for me? Time with family and friends – and this year a trip to sunny Arizona! Before going gluten free, I would make cinnamon buns for Christmas morning to have before presents were open. I have not tried to make gluten free cinnamon buns since going gluten free; this recipe will be tried to bring back the memories. Thanks! That cinnamon “roll” looks so yummy as I sit here with my hot cup of coffee. I am so thankful that now my granddaughter has been diagnosed with celiac – that we are able to make such yummy items for her! She was diagnosed at 4 and is doing super! She’s also a Type I diabetic (like me!) and we truly will be enjoying this season thanks to you and all your other bloggers! HAPPY HOLIDAYS! My brightest part of Christmas this year is that my children are the perfect age in that Christmas is so magical for them and seeing it through their eyes, brings back that magic for me. They are also getting the idea of giving being as great as recieving and I love all of the secrets going around making secret gifts for each other. My new baby grandson makes the season bright for me. There’s something magical about Christmas with a little one that makes everything even more special (even tho he has no idea what’s going on). As always, love your recipes. For something so fancy looking, this sounds easy. LOVE the photos of the kids. OMG, they are so cute! What makes the season bright is my family together for the holidays! This cinnamon bun looks great!!! I’ll have to try it. The best part of this season is spending extra time with family & friends you may not see often during other times of the year! Seeing my family makes the season bright for me. The cinnamon bun looks awesome ! Can’t wait to try it. This looks so delicious. I have a hard time finding all these different flours where I live, but would love to try this for Christmas morning. I love everything about Christmas, the Christmas carols, the decorations, Hallmark movies. But mostly I love it because of what God did for us on that day. He sent His son, Jesus Christ to this earth to become a living sacrifice for our sins and to reconcile us to Himself through his death on the cross. Hi Deborah, if you can find a good all-purpose gluten free flour blend that you like (I really like Pamela’s or Pure Pantry or Tom Sawyer or King Arthur), then you can just use 2 cups of the all purpose flour in place of the first four flours listed. And thank you so much for sharing the real reason of Christmas and why it is so special. After all, that is the most important reason. Have a wonderful holiday! I just love seeing it all through my children’s eyes. It’s so refreshing to see how much joy they get from all the little traditions we are creating together! This would be a fabulous treat to have xmas morning. Being the second Christmas of gluten free for the kids, not being scared of baking, having fun and making new family traditions making this year bright. Having the kids feeling better and my son not so sick for the holidays. I just printed the recipe for that cinnamon bun cake, it looks magical! I will be making it for Christmas morning. My season is neon bright, because I get to spend it with my friends and family. So many gatherings that bring us all together. Spending time eith family, sitting by the fireplace, eating out favorite things that we always eat this time of year. Yuuumm! Looking forward to making the cinnamon rolls. I love all your substitutions! I think what makes this season bright for me was those pictures and stories about your boys. Nothing could complete that better than your Cinnamon Raisin Cake. I love the excuse I get to bake until I drop and then the late night tour of the homes lit for Christmas. This recipe looks amazing! Is there another flour that I could substitute instead of millet — I don’t have any of that flour? And instead of yogurt, do you think milk kefir would work? And thanks so much for the give-away! I love the holidays because it’s a time to see my family. My husband (of 4 months!) and I now live several states away from our families, so I love this time to see them all again! Stephanie, you can use more almond flour in place of the millet, if you are not nut-free. And kefir would be perfect in this. It would act a lot like buttermilk would. Have a wonderful holiday! I’ve shared this post on Twitter! I’ve shared this post on my Facebook! 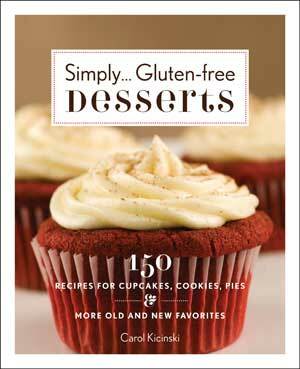 I love celebrating with food, family and friends – and all these gluten-free recipes will make this year even brighter!! 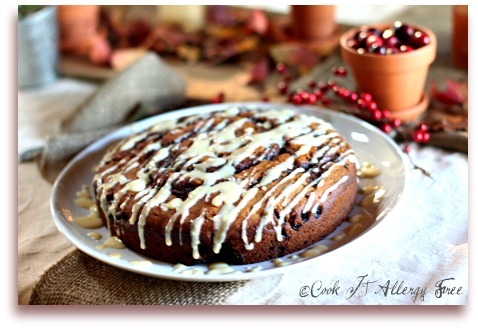 Been looking for a gluten-free coffee cake for the holidays – I think I’ve found it ;)! Spending time with family and not having to travel makes my holiday bright. I love cinnamon anything, so I will definitely try this. Yum-my! What makes the season bright for me is watching my kids sing Christmas songs while my husband and I make a large breakfast on Christmas morning. So fun! While I’m sure my comment isn’t original, it rings true: what makes my christmas season so wonderful is seeing the decorations and tree through my young toddlers’ eyes! I work for The Salvation Army providing Christmas meals and presents to children who will have none this Christmas. It makes my day to see the parents so happy to know their kids will have gifts when they would not have them otherwise. That makes my day. What makes my Christmas special is being with family and friends, and church services celebrating the birth of Christ. It never gets old. The cinnamon roll cake will be on the table Christmas morning. I can’t wait!!!!! I love the holidays! I especially love decorating and thinking about that perfect thing to get for that certain someone (my super hard working hubby this year). I love wearing bells for jewelry and going crazy with decking the halls in my favorite color, red. I also love getting together with my family for our special cookie baking day. This year, that will be a little different since I found out that I am allergic to wheat and yeast. I can’t wait to try this recipe, it looks so super yummy. It also reminds me of another tradition, before I got married we used to get the Pilsbury cinnamin buns and I would put then on the pan in the shape of a tree, then dye the icing green and brown and ice it to look like a tree. Now it looks like I might be trying that this year in a gluten-free style! I can’t wait to try it! Most of all, I hope to be making new traditions next year, when we hope to start a family. Right now the cutest story I have to tell is that my dogs love to lay down right under the Christmas tree. Right now our newest addition has discovered the tree skirt and couldn’t wait for me to finish putting it down before she claimed it. Next year… I drean of holding a little one who gazes intently at those twinkling lights on our tree. I LOVE making giant cinnamon rolls with pizza dough! Makes the rolling part so much easier. This looks perfect! I seriously want to lick the plate with that glaze! Love the photos of the boys together. Too sweet! That looks gorgeous! Yum, I’m salivating! … What makes my holidays bright is spending it with family. This season is a perfect excuse for turning on the oven. I LOVE to bake and the “fresh out of the oven” smell keeps the season bright all winter long! The brightest part of the holidays for me will be getting together with all my children-all adults now on their own-here at the homestead. I love that you have options on this for egg free! I love seeing my children faces light up when they see or discover new things with the holidays. Seeing lights, remembering ornaments, asking to make gingerbread houses…they all add up to a magical season here! Oh my. I believe this recipe will become a tradition for us. 🙂 I am loving all the wonderful new recipes this contest is bringing and all the positive attention to gluten free living. The excitement in my boys is what makes this season bright for me. Oh, and getting to visit people that live in snow and have a snowy Christmas morning! Wow!!! This sounds absolutely amazing!!! Christmas lights and music – that’s what I love about this season! I love seeing all of the beautiful displays and singing carols. Baking up a storm with the Christmas music blaring. Decorating the tree. All of it – I love it all!!! Posted on Facebook! I know of a few friends who will love this recipe!!! What makes my season bright is celebrating my first healthy winter gluten free!! Thanks for the recipes! The chance to go home and spend time with my mom is giving me something to look forward to. After a recent cross-country move, I’m missing our time together. My house is going to smell like Cinnabon! (And this will surely taste far, far better…) Thank you! Wow, that looks so delicious! Will definitely be making that one! What makes the season bright for me is the build up – decorating, sending and receiving cards, opening the advent calenders and counting down each day. The secret meetings and conversations that go on between us all as we plan our gifts to each other! My kids get so excited it’s quite infectious! What makes this season “bright” for me is sharing the true meaning of the season w/my kiddos. This one was suppose to include that I shared this on FB. yum yum yummy ! cant wait to try this ! just woke us to this recipe what a nice surprise!! This year I am sooo excited to be able to walk. I had major foot surgery and it has been a tough situation. One of the things that makes the season bright for me is special recipes and sharing the cooking/baking with my son – great together times!! What makes this season bright is seeing how excited my kids are. They are finally old enough (well, 2 of them are) to realize whats going on around them. I love seeing their faces light up whenever we do a christmas-related activity. OH. MY. GOODNESS! What a fabulous recipe. Thank you for sharing and reminding us all about the “simple joys” that often can be overlooked during the busy holiday season. What makes the season bright for our family is going out to cut down a tree the Saturday following Thanksgiving and decorating up the whole house and turning on the Christmas lights on the Sunday after Thanksgiving. It’s also sharing goodie bags filled with gf baked goods for all our neighbors and delivering them on St. Nicholas Day (today). Merry Christmas blessings! My goodness, I need to give myself insulin just for THINKING about this. YUM, Kim, YUM. My mom and I are going to visit in Jan and I would LOVE to make this with you. This looks AMAZING. I love how you give all the options and alternatives, depending upon sensitivity to certain ingredients. I have to try this recipe. We love cinnamon buns, but I try to stay away from yeast, so this will great! Thanks for sharing your recipe. Love it! My boys have all gone gluten-free this year and my husband is feeling a little ‘neglected’ this holiday season because the holidays have always been a time of rich, comfort foods for him. But I can hardly make him a rich, gluten-filled treat (or allow him to make himself one) and then tell my boys no. So, I’ll make this over the weekend and hopefully it will fill him up briefly. Thanks again! Being with friends and family makes it bright for me! Knowing that this time next year, our precious baby girl we’re adopting will be home from Eastern Europe enjoying this beautiful season with us makes this Christmas even more exciting! Great recipe! I love how it looks like a giant cinnamon roll without all the work. Definately going to try this one! This year, I’ll be more in love with the holidays because it means a break from Teachers College….which is fast and furious. I cannot wait to be done this final essay, and finally time to stay home and bake up a storm for the holidays. I love our Christmas morning tradition and the on the Boxing Day couch routine that I have had for many years; pot of tea and grand marnier, a great book and the fire going all day long. Books have always been a huge part of our families Christmas. And yes, on Boxing Day the house is quiet, save for the snap of the fire and the turning of pages. The cinnamon bun looks amazing. Christmastime is my favorite time of the year. It means sharing the warmth of good food and good memories with the ones we love most! Looks great and will definitely make my season brighter! This year’s Christmas is with the in-laws and they always have Pillsbury cinnamon buns for Christmas breakfast. Now that I’m GF, I will be making this and bringing it for me! Hooray for modified traditions! My family (especially my grandchildren) makes the season bright for me. Also, I volunteer with Habitat for Humanity and this year two families will have new homes just after Christmas in our small community. That certainly adds to the Christmas spirit. This looks great! What makes it Christmas at my house is sugar cookies with the kids and listening to a old tape of Christmas music. Getting time off from work to spend with my family! What makes this season bright: three things. 1) my little family’s determination to celebrate big and really enjoy Christmas, even though we lost my dear sister and her family of 5 to the west coast this past August and my kids have never not celebrated with their cousins! 2) that this is probably the last year of no-holds-barred Santa magic belief (my kids are 5 and 7), and 3) for the first time, my parents are staying with us Christmas eve/day and will get to participate in the magic through our kids! Thank you for this give-away–it’s incredible! Lisa, I think this may be the last year of no-holds-barred Santa belief this year too! My kids are 7 and almost 5 and it is the kids at school that worry me most. I fear someone there will be spilling the beans soon. ;( Enjoy doing it up big with your family and having your parents be a part of the magic! This season is bright for me because I get to share my cooking with friends and family! The memory’s that are made makes my season bright!!! 🙂 thank you for the chance!!! That cinnamon bun looks amazing! Thanks for sharing your Home for the Holidays! I really miss cinnamon pastries (read Cinnabon; yeah, even with all that bad sugar and butter). Maybe this will help to sate that craving. Thanks for sharing! This looks great! I really appreciate the nut-free option, too! What makes this season bright for me? Hmmm. I love that it’s the end of semester and I get a break from study. I can sleep in, and get up and cook most of the day, and have the time to clean the kitchen properly. I also love the cold days and clear skies!! BTW – that cake looks AMAZING. I can’t wait to make one!!! I always think back on my childhood Christmases and how much I loved them. Then I think about how I can continue building great memories even though my family is so far away. I try to give a wonderful celebration for my new family and friends. What makes the season bright for me is customizing old family traditions to suit our changing family and creating new ones. Being with my family and reaching out to others are some of my favorite parts of the season. That looks yummy! Favourite holiday traditions include a family time before stockings where we say what we are thankful for or what has been special to us that year. Oh my boys will LOVE it if I can make this. The one thing they’ve been craving is cinnamon rolls since we’ve been GF/DF. Can’t wait to try it. What makes the season bright for me is my family. We are so spread out that we can’t be all together at once. We are in spirit, though, and that counts for a lot. Seeing my kids get excited about finding ways to be generous and about helping others is what makes this season bright for me! Being able to celebrate the birth of our dear Saviour with family and friends is what makes the Christmas season bright. What makes this season bright for me? Making shoe boxes for children around the world less fortunate and of course, cooking yummy things for friends and family. Thanks for the recipe. YUM! This looks so good and eggnog glaze! Wow! Holidays for me are special because of the family time! I love getting together with loved ones and being silly, eating great food and just sharing in the joy of LIfe! This time is a special time of year because it affords me casual time to be with friends and family. It’s cliche. I know! But I am a freelance worker who is and has a son who is allergic to gluten and dairy, so my time is limited in my “regular” life. The holidays seems to be one time of year to spend with those who we don’t see throughout the year due to distance issues or work demands. It is unfortunate that we don’t MAKE the time to spend with our loved ones, but it is a fact of life. This year will be a special one because my son is four and the magic of Christmas is just everywhere in our home. I am looking forward to it all. This recipe looks unbelievable! Thank you. Being with family makes the season bright for me! What makes the season bright? Getting ready to welcome our son and his fiancé home to visit for Christmas! We live in the Czech Republic so treasure the fact we get to have them here for three weeks to enjoy some of these precious engagement days before their June wedding! Plan to make your cinnamon bun recipe Christmas morning…thanks for the recipe!! My in-laws still live in the Czech Republic…my husband came to the states in the 90’s. Where do they live??!! We live on the far eastern side of the country, in a small town named Frydlant nad Ostravici. Wonder how far away they are from here?! Wow, i wonder if you can substitute coconut flour for the brown rice flour and tapioca flour for the millet flour? I’m grain free too, but this is just TOO delicious looking not to try! Holidays for me are hot kitchens with mom, crazy family members, sipping port, and most recently, showing my 15 month old daughter all of the wonders of Christmas. that’s my favorite part =). oh, and i shared this on Facebook!! Happy Holidays! Also, Christmas traditions with family makes the season bright for me! 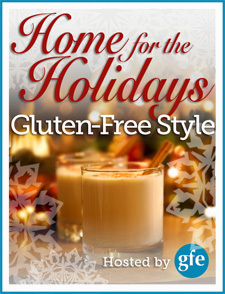 learning to be gluten free with such great recipes makes my holidays bright. adds to the tradition. It has never been about the gifts to me. Happy Holidays!!! Spending time with family it all that matters to me! Spending time with family makes my season very bright! I can’t wait to make this…i’m newly g-free and always up for a new recipe! My season is brightened by my family, the lights, and this year – by the discovery of recipes like this that may let me continue to enjoy the flavors I love! Mmmmm. Cinnamon roll. And I think your chocolate covered marshmallows on a peppermint stick are adorable too! I love the feeling of Christmas – as a matter of fact, I love many of the same things you mentioned in your blog post above. Reading Christmas books, singing Christmas songs, looking for Christmas lights, drinking hot chocolate! I love it all! Thanks for this amazing recipe!!! Spending the holiday together with my husband as newlyweds! I shared on Twitter too! Thanks! Holidays for me are about being with my family and friends, and teaching my boys that there is more to the Holiday season then gifts under the tree or Santa. We teach them and show them by getting out and volenteering in the community or by helping those less fortunate then we are. I enjoy giving homemade items to people I love. My favorite is to go above and beyond expectations – so many are now gluten sensitve that it is a real treat to share these treats with them! Um, YES PLEASE!!! Can’t WAIT to taste your creation!! Oh and, I absolutely love watching my children live in the magic of the season! From finding their Elf every morning, to the hushed talks amongst themselves about not being on the naughty list, to the magical look in their eye when they see Santa for pictures…it is so special, I cling to these times! I love trying new holiday recipes! This looks yummy! I am loving these giveaways…my kids make the season brighter, they bring magic to the holidays. Since we live far away from extended family, I relish the simple joys with my two sons and husband. My older son is terrifically crafty and it is so fun to see what he has snuch under the tree for us. My younger son becomes a ball of hugs around the holiday season. They definitely make my season bright! I shared on facebook. Thanks! what makes the season bright for me are the family get togethers – which are always super fun no matter what season it is! wow, that cake looks delicious! i think i’ll have to try making it! The season is always made brighter by the laughter of friends and family. My great nieces giggling and wishing for snow to sled in is a pretty solid highlight too! What makes the holidays bright for me are THE MEMORIES. I can easily slip back into my Iowa childhood when Santa came at midnight on Christmas Eve and we awakened to Christmas overnight! We lived in the country and went to one of Dubuque’s famous one-room-school houses. We weren’t near any stores and people didn’t have Christmas lights and decorations like today. It was truly magic to us. Today, Dec 6th, is St. Nicholas Day and we celebrated that day also in our German-Irish neighborhood. A huge pounding came on our front door and we would find a bag of tangerines and assorted nuts. We always searched for St. Nicholas and could never even find his footprints in the snow. It was wonderful! Thank you for your gluten-free recipes and insights. This is somewhat new to me and I’m so grateful to find that others have walked this path before me and I have so much help figuring it all out. This year we are doing a family vacation to the Bahamas for Christmas (Dec.13-19) since my kids are scattered all across the country. So, my family always makes Christmas special! But with the trip over and no other gifts, trees, parties, etc. I am excited to concentrate on the real meaning of Christmas-Jesus! Too often He gets lost in the plans, stress and fun of the holidays. I shared this on FAceBook! Love your site! Must try this recipe! Looks so good! Thanks! Holidays for me were my Nana’s chicken soup on Christmas eve and LOTs and LOTS of cookies! My Nana made a chocolate cookie with peanut butter chips that was to die for! I think we found our christmas morning treat!! My family has a holiday tradition of cinnamon buns on Christmas morning. I’d like to try this recipe out this year so I can join in. I have been missing cinnamon buns so much, but just haven’t felt I had the time to make some GF from scratch. Your recipe looks like just the answer! Seeing the wonder and awe on childrens faces makes this season bright for me. Oh My! This simply looks amazing. All the right flavor combos. What makes the holiday bright is spending time with love ones who have moved away…. we miss them so. Being healthy this year for Christmas makes this season bright! 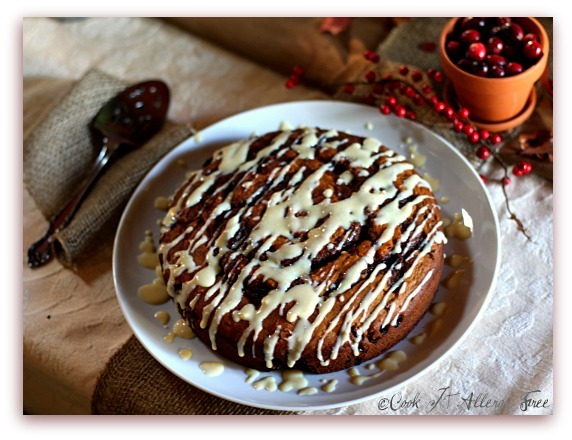 Your cinnamon bun cake looks incredibly delicious!! I can’t wait to try it out!! Spending time with my family and friends makes this season bright for me! One of the things that brings me Christmas joy is a cold evening with the stars glittering above, the sounds of neighbors singing carols and sipping hot choclate. Merry Christmas. I tweeted about your yummy cinnamon bun cake. i love spending quality time with my family around the holidays! I will get into the kitchen and make this cinnamon bun. I have not had one since going gf. Looks great. Hopefully I get it right. Wow, gluten free cinammon rolls. Holidays are a time to remember our loved ones, past and present. We must also remember and pray for the troops that keep this wonderful country free and save. A big thanks to them!!! this cake is beautiful!! What makes the season bright for me? This year, it’s the fact my three year old really gets Christmas now. It is so fun to see things through her eyes this year! Like you, what makes the season bright for me is keeping it simple and focusing on the things that really matter. Spending time with those I love always brightens my day! This is my second gluten and refined sugar free Christmas and I am much less intimidated about what to serve at special meals this year. This is due in large part to the many wonderful bloggers out there who share their recipes with all of us. THANKYOU!!! You all have made the season much brighter! My boys have been hounding me for cinnamon rolls these past 2 weeks. This looks like the perfect solution! Shared on Facebook! This season shines for me when I see people that ordinarily aren’t overly kind or compassionate open their hearts a little bit. I always have hope that it will continue into the rest of the year! I love everything about the holidays…decorations, music, food; I am so thankful to all of you bloggers who share your recipes for allergy free goodies with the rest of us! So many things make this season bright for me, but probably the best one is just being with family and spending extra time to purposefully remember all the blessings I have. Thank you for a great giveaway and recipe. Can’t wait to try it! One of my favorite Christmas delights would be the lights. I love the glow from the strands of white lights. I may just leave them up all year. Sharing special moments with family and friends with old family traditions and the making of new ones along with good health, who could ask for anything more. Merry Christmas all! Cinnamon rolls have always been a tradition on Christmas morning even now that my kids are grown and moved out. We have them when they come home or on Thanksgiving if they’re home for that instead. This past Thanksgiving I made them but could only watch them eat without me! So happy to see this recipe, I’m going to try it for Christmas even though it will just be my husband and I! Thank you! I love all the get togethers and driving around looking at all the beautiful houses all decorated. Finding that perfect gift for someone special in your life brightens my own. For me the holidays are about sitting around with my family enjoying some of my Grandmother’s traditional baking and drinks. This year I’m trying to recreate these, allergy-friendly style. Gotta get those same tastes and smells, or it just isn’t the same! Shared on Facebook! I would love the VitaMix!! 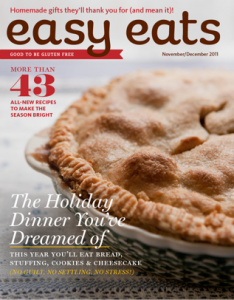 Thank you so much for including Easy Eats in this post; we are thrilled that you are enjoying our magazine! Thank you; have a fabulous holiday season. What makes my season bright this year is baking cookies with our toddler! She just loves helping Mommy in the kitchen. Wow – those cinnamon buns look amazing! I can’t wait to try them! My favorite things about the holidays are christmas trees and decorations. I love the warmth and the cheer! Spending time with my children and grandchildren make the holidays special for me. This cinnamon bun cake looks amazing! What makes the season special for me is the lights and decorations and all the good food and good times spent with family and friends. Love the holidays! What makes the season bright for me is spending time with family, the beautiful music, and all the delicious food! what makes my season bright is decorating the tree with my husband while wearing santa hats! and I am so making that for Christmas morning! looks delicious! What makes the holiday season bright for me is spending time with my family and the joy on their faces when they open their gifts. I also love all the beautiful lights in our town, we like to just walk around or drive further out to look at all the decorations. Awesome looking cinnamon roll there! What makes the holiday season brighter for me is hanging around in front of the fireplace, playing board games with the family. Extra points if it’s snowing outside and we have a bag of marshmallows to roast! I would so love to win any of these lovely give a ways. That cinnamon roll cake looks heavenly! I can’t wait to bake it! What makes Christmas bright for me is that it’s about Jesus! Having a personal relationship with Him is the best kind of relationship you could ever want to have! So…He makes Christmas and every other day bright for me! The joy and delight and excitement of my children is what continues to make my Christmas bright. Even through some dark years, they have still brought me joy. This recipe looks amazing. I haven’t been able to find a good replacement for my mom’s Christmas Bread yet; this might be it. I just tweeted about your give-a-way. oh my goodness gracious! I had given up ever sinking my teeth into a cinnamon raisin bun and having the flavors dance across my tongue! This is an absolute family favorite! we will soon be surrounded by our grown daughters and their boyfriends, savoring new recipes, playing loads of board games and catching up through stories and laughter, as they all live out of state now. 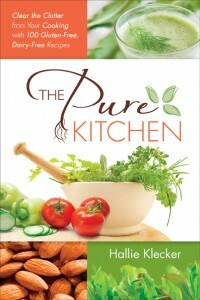 I would love to win anyone of these fabulous cookbooks. thank you for all the time you put forth. My family makes this season worth it. Oh now that looks tasty. Something I’m now going to have to make. But what makes the season bright for me, is slow downing and taking in the change of seasons. Enjoying good times with friends and family and being able to share good meals, laughter and company of one another, which the holidays should be about. Wow! I am glad i found your blog. I see lots of good helpful info and recipes. Loving the jumbo cinnamon bun. It’s is the simple things that make the season bright for me… twinkly lights, a child thankful for a simple gift, and mostly thinking of the first Christmas and the light that Jesus brings to this world… no matter how difficult life is, He gives hope. What makes this season bright for me is, to be able to spend time with my loved ones and cherish these wonderful memories . I just shared this giveaway! Thanks for the yummy recipe. Yumm, this looks delicious. I’ve missed cinnamon buns so much since eating gluten-free…. time to bring them back just in time for the holidays! Our Christmas breakfast is always such a sweet way to start our family’s day; your recipe looks like a great new tradition in the making! The joy I see in my daughter’s eyes she gets to experience the holiday is my favorite thing ever. Doing all the traditional things is so fun! And learning all about GF living is makeing them even happier! Wow, I am making that for Christmas morning! What makes my holiday bright? Now that my daughters are are young adults its having them here for the holidays. My younger daughter is in college, and I am so impatient to have her home again! The older one lives with us, but works and is out and about more often than not. Happy holidays to all! this recipe looks wonderful!! cannot wait to try it this weekend! thanks! what makes this season bright is that my husband takes most of his vacation time at the end of the year and we can spend lots of time together just relaxing. Lovely recipe; thanks Kim! What makes this season bright is my return to the Sonoran desert, land of Sunshine 🙂 Was away at school in NY for many years, so now I am grateful to be with my family for the holidays once again. I think this might make a great birthday cake. Checking for ingredients now! The thing that makes this holiday season brightest for me is getting to spend time with my family. The smiles on the faces of loved ones is what make the season bright for me! Spending time with my family is what brightens the season for me. Thanks! I can’t wait to try this recipe! I miss cinnamon rolls on Christmas morning…this may be a new tradition! I love this time of year with my children when we can play in the snow, build snowmen, and cross country ski…escape into our beautiful Montana winter wonderland! Which linked to my facebook! Yay! What makes the season bright? The excitement of my kids over each little thing. This year, especially, the thrill of opening the door on our new advent each night. They anticipate it all day. OMG! This looks wonderful. I’m going to make it tonight to see if it is worthy of Christmas morning breakfast. What makes the holiday season brighter for me is creating new memories with my family. Such a special time of the year for all of us. The decorations, gifts and delicious food are just a bonus! Your cinnamon bun christmas cake is definitely being added to this year’s christmas morning feast. Thanks so much! That looks amazing! We will have to try it! Way easier than cinnamon rolls! Thank you for sharing! Family, decorating, listening to Christmas music all make me happy. Can hardly wait to try this recipe!!!! The smell of pine trees and cinnamon make the season bright for me. And as much as I pretend to be a grouch about Christmas music I love listening to it! 🙂 (Just maybe not before Thanksgiving). Christmas is all about family! This recipe looks great! I love spending time with family over the holidays! It’s everything Christmas to me~ decorating, the music, food, FAMILY. This year it will be experiencing it thru my grandson’s eyes for his first Christmas! I love everything about Christmas time – the music, the lights, time with family!! 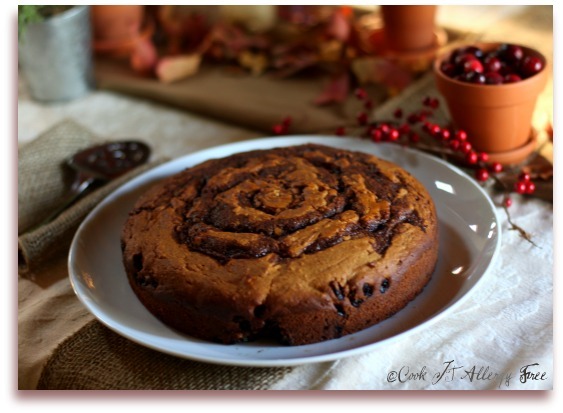 Anything with cinnamon is a winner in my book – and that cinnamon bun cake looks great! I love getting together with family around the holiday season! As for me, we recently moved to a new state and I am looking forward to going back “home” and seeing family and friends. Being surrounded by those who know and love us is a much anticipated “season brightener” for us! Thank you so much for sharing this wonderful recipe. Me and my daughter are both gluten and casein free but this is our first Christmas and I’m struggling with what treats to make but still keep it yummy for everyone. This looks like a super winner! Spending time with immediate as well as extended family is what makes the holidays special to me. We all live such busy lives and don’t spend nearly as much time together as I would like. With two of children away at college and the others busy with their personal lives and my husband so busy with his job sometimes it feels like we are strangers. Everything slows down a bit and we can catch up and laugh together for a week or two. LOVE IT! This looks sinful but oh so yummy! It is going to be hard to pick only one or two of these fabulous recipes to share with my family. Since we are traveling to my brother and sister-in-laws, they tend to already have so much food already made so I will pick a couple that I can take along so I can enjoy, too! What makes the season bright for me is the wonderful Christmas songs and carols! What makes the season brighter for me is reconnecting with all of the people we often don’t see day to day through the year. The joy and happiness shared, the good wishes and the spirit of the season – Jesus – shared will all during the concerts and caroling. shared this over on FB on my Celiac in the City page! I love decorating the tree with ornaments from places we’ve traveled to. The giant cinnamon bun looks to good to be true – can’t wait to make it. The thing that makes the season bright for me is just seeing all the christmas lights outside . Even just a simple string of them across the front of a house at night glowing is neat. What makes the season bright for me is knowing that I can make holiday treats that are safe for my son and me to eat. There are so, so many holiday treats that we *can’t* have. It’s so much fun to try out new treats that we *can* have. My children’s laughs, smiles and our chance to love on each other…especially with 3 snow days. First off, oh man, a big cinna cake! Yummy..
I’m from the old school & love the old fashion Christmas where we would go to church, pray & honor our savior, go home to a wonderful buffet of foods, sing, & go our to separate homes for the kids to snuggle in their beds & await for the sleigh & reindeer to carry Santa to each house in hopes of receiving that very special item….These were the good ole days…. Getting together with family and friends is what makes this season special for me. Thanks for sharing this recipe, it looks really delicious! This sounds and looks absolutely delectable!!! I must try this recipe. Thank you so much for creating a delicious treat and your pictures of your boys are so sweet! Have a blessed Christmas and wonderful 2012. Please include my name in your SWEET giveaways. What makes my season bright is having my adult children coming home and spending time hanging out, and playing games. Learning more about Channukah has been a new cheer for me this year! I love being with my family and friends and baking for them, and playing lots of board and card games. this sounds wonderful! I’ve had to go gluten free this year and we just found out that my 13 yr old step daughter is lactose intolerant so I’m scrambling to find alternatives for some of our usual holiday fare..
What makes the season bright for me is being able to do a lot of baking. Your cinnamon bun looks awesome! I am going to have to try this as soon as the kids are out of school and allowed to have sugar. Thanks so much for putting all the substitutions in the recipe. I’m so glad so many awesome food bloggers are doing this. This is my first holiday GF. I’m so excited to try this to make for my parents for breakfast on Christmas. Yes, breakfast. Why not? Cinnamon buns are excellent for breakfast and all the more exciting as a cake to share! lol!!! This is my first Christmas gluten-free (and casein-free) so it’s also the first Christmas when I know I’ll feel great. That’s worth celebrating! I love cinnamon rolls so I’m definitely going to make this. Thank you for creating this recipe. Letting the kids decorate the tree…writing letters to Santa…and getting cuddly around the fire…love this time of year! Shared on Facebook…can’t wait to try this cinnamon bun recipe! Can’t wait to try this recipe! I love anything with cinnamon. We enjoy driving around looking at Christmas lights while listening to our favorite Christmas songs. My son prints up a card for the grand prize winner of the light display and we present it to the owner of the house. This is always so much fun to see their faces as we tell them. Love to brighten someone’s day. I love to decorate my house and see the joy in my kids’ eyes. OMG!!! Dreams do come true!! The giant cinnamon bun (cake) looks incredible!!! The Holidays are full of LOVE for me….everywhere I look!! Having my family together. I did not have that growing up. It is so important to me along with the holiday foods. I love church on Christmas Eve and Christmas lights! What makes this season bright for me is not having a stomach-ache and bright red face all the time b/c now I am g.f! Oh Wow! First Christmas Gluten free and I can’t wait to make this “giant” cinnamon bun! I really miss a good cinnamon bun. 🙂 LOVE!!! Just posted the link on Facebook! This season is made bright by spending time with loved ones! Family and friends are what makes this season bright…. as well as cooking all the goodies I can! This holiday is going to be bright because I’ll be able to spend time with my brothers who have both been overseas! I can’t wait. And shared on Facebook for all my gluten free friends! My favorite part of the holiday used to be eating all the gingerbread and Christmas cookies that I could get my hands on. Since I have to be gluten-, dairy-, and sugar-free now, I have to be content with what used to be my 2nd most favorite part: buying presents. I hate crowds, but online shopping is a lifesaver. Oh my gosh, this looks delicious! I will have to make this Christmas morning (for our first gluten-free and dairy-free Christmas)! Thank you! Spending time with family makes this season bright for me. I can’t decide what I want to eat up more – your boys or the cinnamon bun! Looks delicious! Definitly trying for holidays. This looks delicious and I can’t wait to make it for my boys. What makes the season bright for me? Definitely the hope and joy that Christ’s birth has brought to our lives, especially this year when things have happened that have been very difficult for our family. Also, my four-year-old son makes the season bright. Each year, he understands Christmas time a little better, and seeing the world through his eyes is magical. He really enjoys everything about this season, and it makes it so much fun to experience those things as a family. Wow! That looks amazing! Perfect for sharing with those I love during this season of wonder and joy….. This looks amazing! It will be perfect for Christmas morning with a plain vanilla icing; our first gluten free, vegan Christmas will be the best ever! What makes the season exciting for me, is knowing that I have squirreled away suprises for each member of my family. 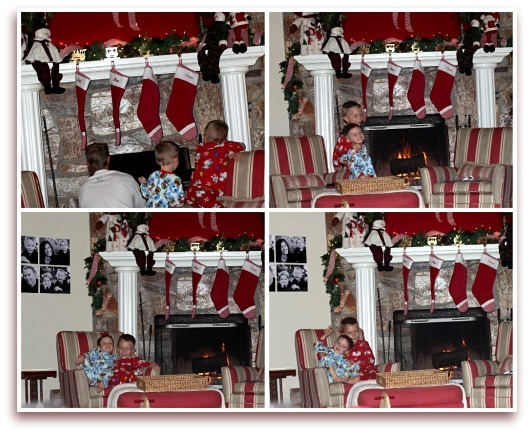 Waiting for their excited faces on Christmas morning…. Can this be prepared at least partially ahead and then cooked on CHristmas morning? Karen, I would say that the night before you can combine all of your dry ingredients in a bowl for the cake batter and also combine all of your filling ingredients as well (and then just heat them up in the morning so you can spread it easily). Then in the morning I would get out all of your wet ingredients (personally I would even get them out the night before – even the eggs – to make it all room temp and quick to throw together in the morning). It actually comes together really fast, for the most part! For me it’s just the luxury of having several days off in a row to share with family and friends. This recipe looks awesome and is going into my “keep” pile. Can’t wait to try it.! My boys, who were both diagnosed with celiac in 2011, make this holiday season and everyday bright. Watching my oldest inch closer and closer to healing makes me feel very grateful. We always had cinamin rolls for breakfast Christmas morning… this looks like a good replacement! Children make the holiday season brighter for me.The season has become much brighter since the grand children were born. Getting to see family that live out of town makes this season bright for me! Wwhat makes this season bright for me? Well, where do I start? I get to spend a week (or more) at home, sleeping in my own bad and having an access to real kitchen. (Otherwise I live in a dorm.) I get to play with my little nephews, take care of my dog, listen to Christmas songs and enjoy holiday food. I love holiday season! I’m not sure if the giveaways are closed or not yet. But either way, this is an awesome recipe!!! Thank you so much for your hard work. OMGsh. One more thing I must add to my to-do list for the holidays!!! It looks sooooo GOOD! Celebrating Jesus’ birth and having all the family together makes me happy at Christmas. Your Cinnamon bun Coffee Cakes looks delicious. Thanks. I like family traditions this time of year too! I love seeing the anticipation on my girls’ faces and how much fun we have making treats for our neighbors and teachers. Yum, this looks so good! Family is definitely what makes my holiday season bright! Happy Holidays!! This looks so incredibly yummy! I haven’t had cinnamon rolls in over a year! Can you use more almond flour instead of millet? I’ve been addicted to almond flour lately since it just seems to agree with our tummies better. My kids (who are gluten free also my son is autistic) will love having a tasty treat on Christmas morning! What makes the season bright for me is spending time with family, especially enjoying a festive meal together! I love cinnamon buns, so this cake will be wonderful! Does this really not crumble with no gums? Shared on Facebook….Question though….instead of the 3 different flours….could you use a gluten free mix such as Bob’s Red Mills All Purpose? http://www.bobsredmill.com/gluten-free-all-purpose-baking-flour.html?&cat=15 If so, would I need to make any other changes? Hi Kelly, You can definitely use an equal amount (2 cups) of an all purpose baking mix without any problem. I used Pamela’s new Artisan mix with this and worked out wonderfully. You should not have to make any other changes for it. Enjoy! Hi Kim! We enjoyed this for Chrostmas morn. I used a combo of quinoa, oat, brown rice and arrowroot flours and used the egg free version, subbing chia meal for the egg replacer. Super tasty…although without the guar gum is was a bit crumbly…albeit moist! Next time I would add a teaspoon of guar gum! Thank for our breakfast treat this morning! This recipe was by far one of the best gluten free recipes I have tried. Fantastic for Christmas morning with fresh fruit!. No one could even tell it was gluten free. Lovely! Yay!! Thanks so much for coming back and letting me know that you enjoyed the recipe. We made it for Christmas morning too…along with a ton of other stuff 😉 . I am glad that everyone enjoyed it at your house! No one knew it was gluten free here either.